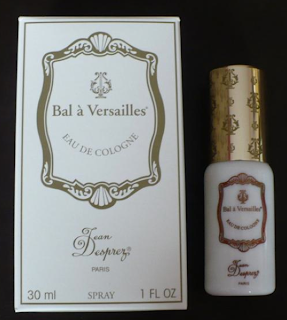 nero profumo: Jean Desprez Bal A Versailles EDC: A Skanky, Naughty Girl. Jean Desprez Bal A Versailles EDC: A Skanky, Naughty Girl. I usually approach reviews for this kind of classic compositions trying to avoid the usual note explanation. I generally prefer to give an overall idea of what the fragrance smells like and always suggest to any "real" perfume lover to not miss the chance to experience such classic beauties. Take vintage Shalimar and deprive it of a little sweetness being careful, at the same time, to manitain a solid dose of spicy and powdery vanilla. Add the skanky aspect of Kouros (the urinous honey note plus the civet plus the greased hair musky vibe) and refine it with a consistent orange blossoms note on top. Et voilà. AMAZING stuff! As a friend use to say, Bal A Versailles EDC is like a skanky naughty girl. Terrific lasting power and great projection. If moderately applied does great also on a man. If you'll ever experience a skankier EDC, please, drop me a line.. This is one of my very favorite fragrances. I own it in EDC, EDT, and PdT! I love them all, but might prefer the EDC just slightly because of its intense saliva quality in the deep drydown. This stuff is beauty in the beast! Agree, the EDC is my favorite as well.